Northeastern North Carolina is bound by a barrier island system that borders the Atlantic Ocean and connects to the Albemarle-Pamlico Sound Estuary, which is the second largest in North America. The region is home to more than 2.7 million people. Millions more visit the area because of its wide array of natural resources, recreational opportunities and picturesque views. The entire region is very low-lying and surrounded by water, leaving coastal communities vulnerable to severe storms, flooding, and rapid shoreline change. The Nature Conservancy has partnered with Dare County, to identify nature based solutions to these risks. The team has developed two applications on the Coastal Resilience mapping platform. These apps will help stakeholders identify: 1) oyster restoration sites to reduce shoreline erosion and 2) open space in the floodplain. This work builds on more than 35 years of conservation in the NeNC region and five years of Conservancy research to assess shoreline risk and vulnerability at the Alligator River National Wildlife Refuge (ARNWR). Much of the work in ARNWR is focused on the benefits of oyster reefs, wetland plant communities and hydrological restoration, and this information will help guide future application of restoration projects and management of coastal lands. Northeast North Carolina is home to a growing tourist industry, a diverse fishing industry, and a wealth of natural resources. Northeast North Carolina is generally less than 10 meters above sea level, and makes up one of the largest areas of wetland resources on the Atlantic Coast, including salt marshes, swamp forests, freshwater marshes ,bogs, and swamps. These wetlands are important to communities. They provide nursery grounds for fisheries, storm buffering, and erosion control. These natural resources also support a healthy tourist economy and outdoor recreation industry, as well as supporting a cultural tradition of recreational and commercial fishing. Coastal communities are in an increasingly vulnerable situation due to the effects of coastal hazards. Actions such as wetland restoration and oyster reef construction can have a positive effect in protecting the shoreline. Now, is the time to map out the risks to North Carolina’s northern coastline and give communities a tool to help reduce risk from coastal hazards. Tourism is an economic engine in the region. In peak tourist season the population of Dare County increases from about 30,000 to 200,000. In 2012, those tourists pumped nearly 20 billion dollars into the local economy. Since a healthy environment drives a healthy local economy, keeping natural resources healthy is vital to tourism. In addition to tourism, many people choose to make their permanent home in the area. But, critical infrastructure such as hospitals, schools and roads are at risk from storm related hazards putting people and property at risk. North Carolina has one of the most diverse fishing industries in the country. 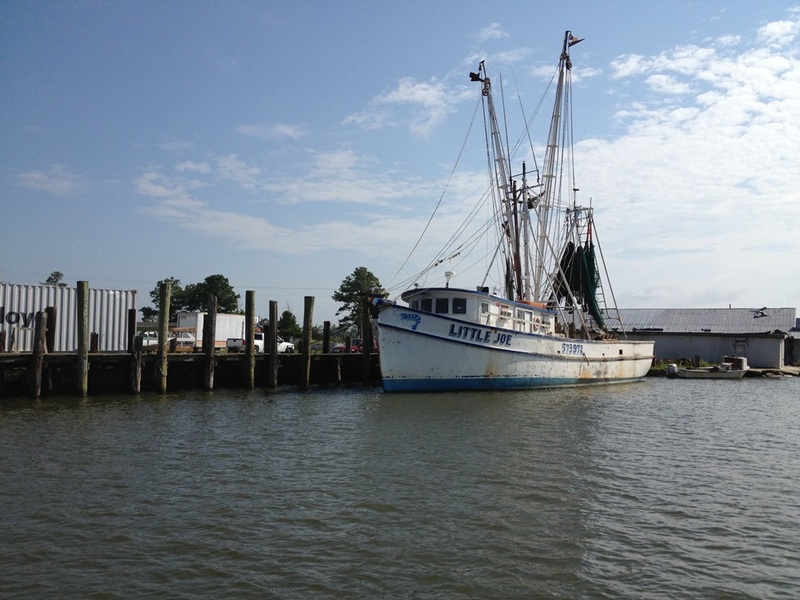 The fishing industry – both commercial and recreational – plays a major factor in the coastal economy. From 2009 to 2013, North Carolina’s commercial landings ranged in value from $71 million to $79 million annually. The fishing industry is also a cultural identity and way of life to many. For some native residents and their families, this tradition goes back more than 200 years. The industry is under threat from natural hazards that can damage critical infrastructure such as bridges, roads, and waterfronts used to dock and move goods. Increases in development threaten water quality, which can negatively affect oyster and wetland habitats. The Albemarle Sound is one of the largest coastal bodies of freshwater in the United States and among all of North Carolina’s low salinity areas, it is of prime importance in the production of anadromous fish, which spend most of their lives in saltwater but migrate into freshwater to lay their eggs. It is a critical fish corridor for adult herring, as well as striped bass and Atlantic sturgeon, which enter the estuary in late winter and make their way to freshwater spawning areas in nearby rivers and creeks. These species have been traditional fisheries of the Albemarle region for many years. Brackish marshes line the eastern edge of the Albemarle and Pamlico sounds and provide many benefits to communities. Areas fringing these brackish marshes support submerged aquatic vegetation (SAV), and account for much of the available shallow habitat behind the Outer Banks. Both SAV beds and marshes provide important habitat for many fish and shellfish, including juvenile blue crabs and finfish species such as spotted sea trout, shad, spot, croaker, weakfish, red drum, striped bass, and white perch. Many other species of fish and shellfish use these habitats for shelter and as a place to find food. As coastal areas continue to experience increases in flooding, erosion and development, the potential for more harm to these natural areas and their ability to provide benefits to communities is compromised. Shellfish beds are an important habitat in the Pamlico Sound. Oysters and clams attach to gravel and old shells on the shoreline, forming spiky oyster beds that help protect the land from erosion. Blue and stone crabs and grass shrimp hatch in the oyster beds and begin to grow there, eating phytoplankton. In addition, black sea bass and flounder forage for food among the oysters. However, shellfish habitats have declined dramatically. Major threats include nutrient and toxic pollution, altered freshwater flows, exotic invasive species, overfishing, and physical disturbances such as dredging. Historically, salt marshes, oyster reefs, coastal forests and barrier islands functioned to absorb energy from wind and waves. As development has increased, and coastal natural habitats compromised and/or lost, communities on the coast are more at risk. Restoring and protecting these natural habitats will reduce this risk. 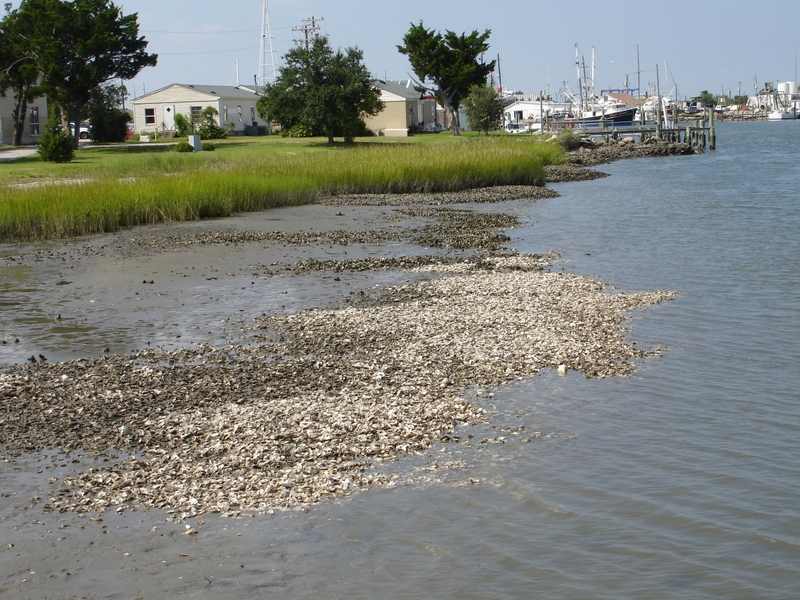 One nature based approach to increasing coastal resiliency is restoring oyster reefs. 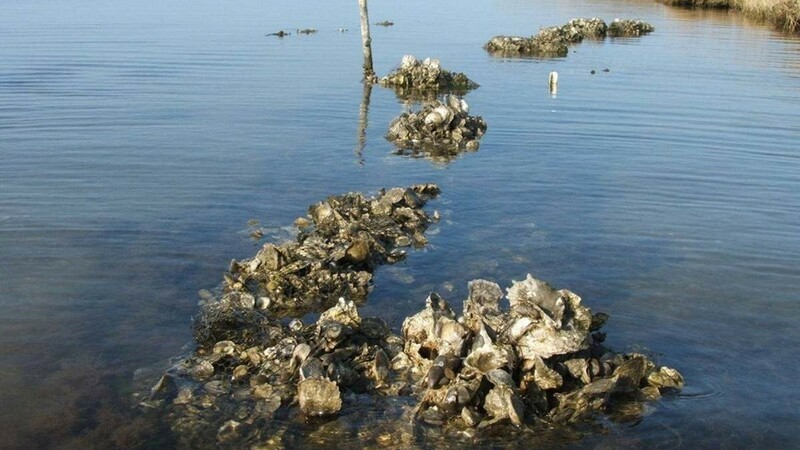 Oyster reefs provide habitat for marine life. Oysters filter water, improving its quality. And, in a world where coastlines are changing, they provide valuable protection for shoreline – building new oyster reefs will lessen wave action and reduce shoreline erosion. The Conservancy has developed an application (Restoration Explorer) on the Coastal Resilience mapping tool that allows community planners and managers adjust an index of oyster reef parameters and determine potential restoration sites. Prioritizing the protection of existing marshes and restoring key coastal marshes is a potential natural solution. Marsh restoration efforts not only provide habitat to fish and wildlife resources, but also give protection to shorelines, infrastructure and coastal communities from storm surge and flooding. They also provide ecological functions such as carbon sequestration, water filtration, as well as provide ample opportunities for recreation. One common response to erosion and flooding is hardening the shoreline through the use of built structures such as bulkheads or breakwaters. In many cases, these structures actually make erosion worse, particularly on either side of the structure where erosion forces are increased. But, there are natural solutions that are effective. One example of a potential natural solution is a living shoreline. This option is an innovative approach that combines various shoreline stabilization methods while restoring and/or preserving the estuary, marshes and upland buffers. Depending on site specific conditions, living shoreline projects range from simple plantings, to more complex approaches that combine wood, stone, or other structures with bank regrading and marsh planting. Natural solutions such as living shorelines, restoring and protecting oyster reefs and marshes can provide lasting benefits to both coastal communities and the environment. The Conservancy and its conservation partners are working to develop innovative applications for use in the Coastal Resilience tool that allow planners and managers to evaluate where and how restored oyster reefs and coastal marshes may be used to help protect communities from coastal hazards while simultaneously improving habitat. In partnership with the Coastal Studies Institute, TNC built a series of oyster reefs along a highly eroding shoreline at a TNC conservation easement located just north of the Institute and this site will function as a living laboratory for researchers and students. TNC’s Restoration Explorer was used to identify the site and helps others identify where they can use natural techniques like this to stabilize their shores. To protect North Carolina’s coast by ensuring thriving ecosystems and economies, our TNC scientists have been working with university partners to evaluate oyster habitat for restoration potential. 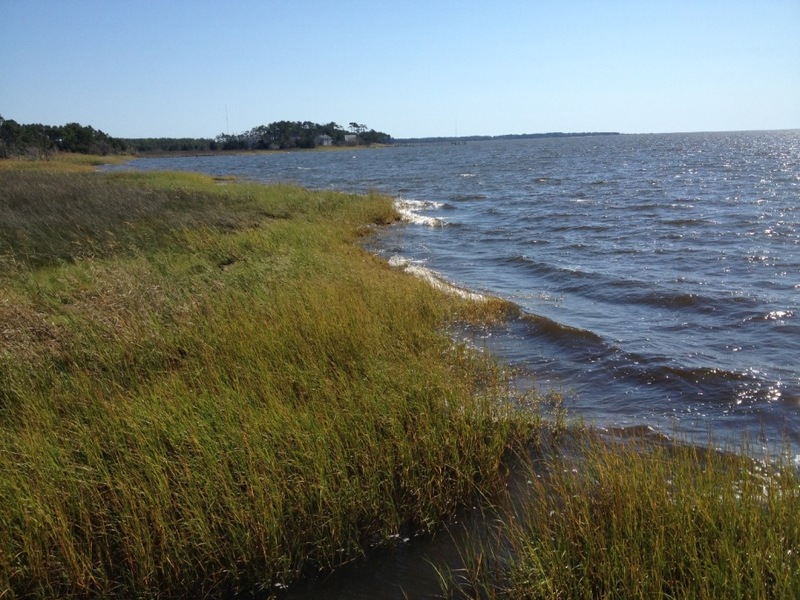 The Living Shoreline app is helping homeowners, engineers, and the regulatory community identify where wave energy conditions are best suited to use a living shoreline for erosion control in in several counties in North Carolina. In North Carolina, The Conservancy has developed a NEW Living Shorelines application (app). Partnering with scientists at NOAA’s Beaufort Lab to bring in their research on the relationship between salt marsh distribution and shoreline wave energy in central coastal North Carolina. The Nature Conservancy worked with several communities in Northeastern North Carolina to develop the Community Rating System Explorer application (CRS Explorer app), an online decision support tool meant to estimate open space benefits and empower planners to fully participate in CRS. The Nature Conservancy has expanded its efforts to restore oysters by incorporating new data into a computer application that helps coastal managers map areas that are suitable for oyster reef restoration. North Carolina’s Community Rating System Explorer (CRS Explorer) assists a community by combining local data with high level mapping tools and calculations to help the community utilize the National Flood Insurance Program’s (NFIP) Community Rating System (CRS).